What an amazing show today! True there wasn't the overflow crowd like in recent weeks, but it turned out to be one of those days where the strange and exotic stole the show. The first thing I saw when I got there was the Mercedes-Benz SLR McLaren Stirling Moss – the final edition of the SLR project between Mercedes and McLaren that was limited to just 75 units worldwide. Love it or hate it styling and a 217-mph top end make this a highlight at just about any show, but this ain't just any show. Master fabricator, welder and designer, Andrew Buck, of Buckshot Racing pulled in with a Monster-sponsored off-road dune buggy that looked ready to tackle anything from the Baja 1000 to the X-Games. It's called the X.2R and one just like it can be yours. Just contact Buckshot Racing. Best part about it was the fact that it was wearing plates for street use. Another street/race hybrid was parked across from the coffee tables...and it too was built to race off-road. In this case, on salt. Suzuki handed over a perfectly good Kizashi sedan to the gang at Road & Track and they bolted on a giant Turbonetics turbocharger, added a bunch of safety equipment and a few aero mods and Sam Mitani drove it to a class record of 203.720 miles per hour a few weeks ago. 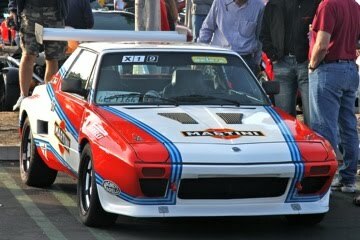 Other than the parachute it looked like it could have been just another tuner car. When was the last time you saw an Opel Monza GSE? Never? One rolled into the lot this morning looking like it had just come off the showroom floor. 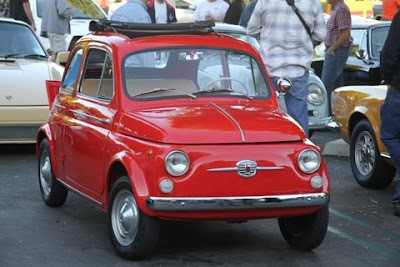 Seriously, this car had been restored or preserved to look like it was freshly minted. Who does that? Takes a decent but mostly unheralded sporty car and makes it look better than new? Only a fellow car nut could appreciate that kind of devotion to one of those overlooked and underappreciated vehicles from motoring history. Great cars all of them, but the highlight of the day for me at least, were the trunk bikes. A group of guys who were definitely a lot more confident in their manhood than the rest of us, came buzzing up on a trio of Honda Motocompo scooters. These 50cc bikes were sold as an accessory on the Honda City overseas, and feature a collapsible handle bar assembly so they can fold up and fit in the trunk of that tiny urban runabout. I've never seen one in person before today and now I've seen three. Click below to go straight to the gallery that includes all of the above plus a whole lot more. Although I've been meaning to go ever since I moved to California in 1992, Saturday was the first time I actually visited the Nethercutt Collection in Sylmar, California. Purchased with some of the Merle Norman Cosmetics fortune, there are more Pebble Beach Best of Show winners here than in any collection in the world. The collection is housed in two large buildings – one is open to the public most days and allows self-guided tours, while the other requires you register for a guided group tour. It's still free, but once you get into the Grand Salon, you understand why they don't want everybody roaming freely inside. 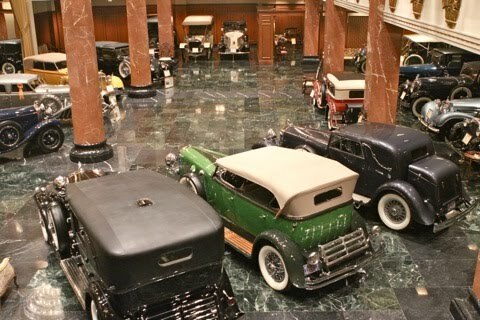 Built to replicate the grand dealership showrooms of the '10s, '20s and '30s, it is a columned marble room with about 30 of the most stunning classic cars you're likely to ever lay eyes on. The tour lasts about two hours and you get to see just about every room in the building. You also get to hear some of the amazing musical devices the Nethercutts collected during their 90 years - 71 of them married to each other - before they passed in 2004. The highlight of the entire museum might be Cloud 99, the upstairs formal dining room and ballroom that is ringed by super rare orchestrions and features a Wurlitzer theater organ with hundreds of pipes and other musical instruments controlled through its four-deck keyboard. The museum really is much more than the cars, but oh what cars. Some of the brands represented are well-known, others may only be familiar to classic car aficionados, and still others are so rare, only the history books remember them. Walking through the two buildings on either side of Bledsoe Street, you'll see cars from Talbot Lago, Duesenberg, Pierce-Arrow, Bugatti, Hispano-Suiza, Isotta Fraschini, Ruxton, Cord, Rolls-Royce, Bentley, Cadillac, Lincoln, Packard, Mercedes-Benz, Minerva, McFarlan, Buick, White, De Dion Bouton, Du Pont, Renault, Napier, Franklin, Eisenach (BMW predecessor), Locomobile, Daimler, Ford, Mercury, Ferrari, Austin, Hudson, Tucker, Volkswagen, Westinghouse, Voisin, Stearns-Knight, Pontiac, Pope, Stevens-Duryea, Graham, Hupmobile, Gobron-Brillie, Cameron, Auburn, Case, Cunningham, and on and on. Definitely worth a visit, you can get more information at the Nethercutt website. Transplanted Chicagoans haven't had many options – besides Portillo's in Buena Park – if we wanted real Chicago style hot dogs...until now. Just Hot Dogs is a great new Chicago style hot dog stand that serves 'em just the way Chicagoans like 'em – poppy seed bun, bright green relish, onions, tomatoes, sport peppers and mustard...never ketchup. They even wrap them with the fries on top. They have chili dogs too, for the non-traditionalists out there, and despite the name of the place, there are also Italian style beef sandwiches on the menu as well. It's basically a drive-thru but there are a couple of tables by the walk-up window out back. Small place but big on charm. Friendly folks that pack every order with extra smiles. They recently started a Friday night car show that attracts about 60 cars. There's room for plenty more though. Great group of people who bring their own chairs and just hang out - eating good food, enjoying each other's cars and even running a weekly raffle for gift cards and other prizes. 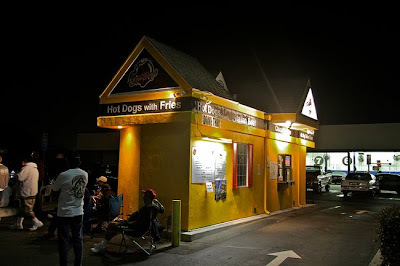 The Just Hot Dogs stand is right between the Pep Boys and the Ken Crane's at 15223 Beach Blvd., just north of the 405 in Westminster, across from the Toyota dealer. The car show happens Friday nights from 6-9. Stop by for a dog or two and tell them Frank sent you. Imports were nothing to sneeze at either: Blue Max BMW with more than 400,000 miles and still looking showroom new, Alpina, a handful of 968s, Dunkel's CGT, Ferraris, Lambos, Alfas...and a Fiat X1/9 that looked like a former Group 4 car. Awesome. Favorite semi-car-related moment of the day was the gal in the custom pink and black Hummer H2 with the crystal toes. Could present a choking hazard in certain situations though. Direct link to pics below. Fog all the way down to Irvine, but even God loves this show apparently as the sun broke through right at the exit for Cars & Coffee. No featured marque today but several small groups of like-minded individuals made it feel like a massive showroom, with half a row of new Camaros, newish Mustangs, Cobra kit cars, Corvettes, Porsches, GTRs and Pontiac G8s today. Highlights in the miscellaneous sections included a cute-as-a-button Fiat 500, Lancia Montecarlo, Lancia Appia Convertible, Mini Cooper, Fiat Spider, Porsche 356 Carrera, Sprite, E-Types, Pantera, Daytona, Mosler, Bullet-Nosed Studebaker, Boxster Spyder, Citroens, Bumble Bee Camaro, H.O. Catalina, Clubman, TVR, the 20-foot-long 1958 Continental MK III, Scuerias, 300 SL, 512 TR, Audi R8s, 400 Superamerica, two 458s, GT40 and some really sweet bikes. Perfect for James Bond wannabes (and pervs of all ages), the Swann RemoteCam is a tiny still and video camera built in the shape of a car remote control key fob. The RemoteCam shoots JPEG stills at 1280 X 1024 pixels, and records videos in AVI format at 720 x 480 pixel resolution at 30fps. A 2GB microSD card is included that will hold up to 25 minutes of video or 3,000 photos, but you can upgrade the memory all the way up to 8GB if you think you'll need more than that. It's a little tricky to judge your shot, but practice makes perfect. This clever little key fob camera is very simple to use, with just a power button and a shutter button. The micro SD card pops in and out of the side and the whole unit is rechargeable through a micro USB port that can also pipe the pics straight to your computer. The pics end up looking like basic, low-end cell phone shots with a date stamp on them. That stamp can't be turned off though, and resetting it to the proper date and time is a bit tricky as well. In fact, I couldn't get it to change at all. Overall it's a fun little gadget with a few limitations that might make it a hard sell at its $100 MSRP. But if you need to shoot surreptitiously, there aren't many options out there this side of ringing up Q. Street price is around $70 and the RemoteCam makes a perfect companion to Swann's other 007 spy cam, the Pencam.